Human hair wig for men and women in boring road Patna by Hi Handsome. Best non surgical hair replacement solution centre and low cost hair bonding / patch services by expert technicians in Patna. Get customized hair wig for your head and look younger in just 2 hours. Hi Handsome has been ranked no. 1 in top 10 hair wigs shop in Patna. Are you one of the victims of baldness? Do girls call you uncle? Do you hesitate in meeting with your friends? Do girls are rejecting your proposal of marriage? We have got solution for you. 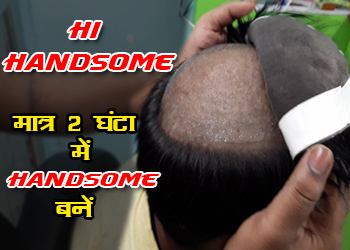 The best hair solution center - Hi Handsome is a well known hair replacement centre located in Boring road which deals in hair related problems. It is the best hair solution center in Patna. Baldness is becoming extremely common in today’s era. There are number of reasons causing alopecia like lack of nutrients, hormonal imbalance and stress. For unmarried people, baldness is most frustrating issue as it enhances the possibility of rejection of their marriage proposals. If you feel inferior for your hair loss and baldness then you might have been searching for some hair clinics in Patna for hair weaving or hair transplant services. But are you aware of hair transplant side effects or hair transplant success rate? Do hair transplant really work? Hair weaving cost how much and what time it takes to let you look younger? Hi Handsome provides terrific hair solution for baldness at lowest cost. This hair wig shop provides complete package of hair loss and hair replacement solution. Our expert hair wig technicians ensures the perfect wig creation and fittings in just 2 hours to make you look younger. You can see the video listed on this page to see how we work. This hair wig store is easily accessible from all locations of Patna including Kankarbagh, Boring road, Bailey road, Ashok rajpath, Bazar samiti. We offer various types of services like Real hair wig, wig dealers, natural gents wig, ladies wig and synthetic wig shop. Price is very competitive. The customers from different locations like Kankarbagh, Boring road, Ashok rajpath, Bazar Samiti and Patna city visits here to cure. We have made more than 500 people look smart and younger in last 02 years of our service. We have introduced Standard Operating Procedures for the first time in field of hair restoration. We have the best hair treatment center in Patna. We take care of all the safety measures for giving best quality results without harming. We have highly skilled manpower which takes care of even minute factors to get desired results. Our technicians make you understand about Hair wig lagane ka tarika. We are one of the top 10 hair solution center in Kankarbagh, Boring road, Ashok rajpath, S K nagar in Patna. We have most advance technology machines and equipments which operate more conveniently. We come in top 10 ranking of best hair solution center in Patna. You need not worry about your future anymore because now it’s our responsibility to make you centre of attraction. We are the best hair wig dealer in Patna. We will bring your lost charm and confidence to make eye contact with beautiful girls. Soon you will realize the change in perception of your friends and relatives. They won’t ignore you anymore. Our team experts will advise you how to take care of your hair to prevent from any further problems. They will assist you about the lifestyle you need to adopt for better results. We have cured more than 500 customers since we started our business. Now they are living a cheerful life with their near and dear ones. We can feel the sorrow and depression you go through when you start loosing chunk of hair. Therefore we are able to understand your problem in proper way and make you feel comfortable. We have established awesome relation with our customers in Boring road, Ashok rajpath, Bazar Samiti, Kankarbagh in Patna, Bihar. Many consumers from other regions of Bihar like Nalanda, Bhagalpur, Chhapra, Siwan, Munger, Kaimur, Mujjafarpur, Ara and Buxar complimented us for on time completion of task. Want to reach us old way?